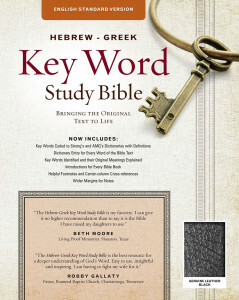 A brand new edition of the best selling KeyWord Study Bible the English Standard Version (ESV) translation. There are times when a Greek or Hebrew word has a distinct meaning that seriously affects the proper interpretation of Scripture. Black Genuine Leather. Unless you are familiar with these languages, you will not be able to determine what word in the original text was used or the differences between these words-until now. The Hebrew-Greek Key Word Study Bible identifies the key words of the original languages and presents clear, precise explanations of their meaning and usage. Those who love God's Word will treasure this Bible, for it contains a whole library of biblical helps within its covers. © 2019 The Bible Source | CP Communications LLC.